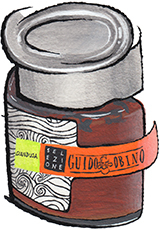 Guido Gobino Gianduja Hazelnut and Chocolate Cream for sale. Buy online at Zingerman's Mail Order. Gourmet Gifts. Food Gifts. Stay away before you get hooked. If you’re a glutton for punishment, or just a good old-fashioned glutton, this stuff could get you in serious financial straits. Guido Gobino gives freshly harvested Piedmontese hazelnuts a generous, slow toasting then grinds them until they're as smooth as velvet. They're mixed with fine milk chocolate in proportions that favor nut lovers. I save it for those rare times when I'm sitting in front of a solid-gold plate of ice cream and in need of an appropriate topping. If I'm feeling especially flush, then I spread some on hot toast for breakfast. Amazing. "Absolute heaven on a spoon! This has been declared 'Private Stock,' which in Mom-eze means, 'Don't touch!'"